Will Thrand Stigandi’s ostentatious attack at Ospak’s farm be enough to win Best Bloodshed? How many bodies hit the floor, and why is it so difficult to come up with a consistent count? In a saga with names like Thorstein Cod-Biter, Thorolf Bladder-bald, and Sigurð Snake-in-the-Eye, who can possibly win Best Nickname? Who will be banished from Iceland forever? Will Andy get to honor his hero Snorri by choosing him as thingman? 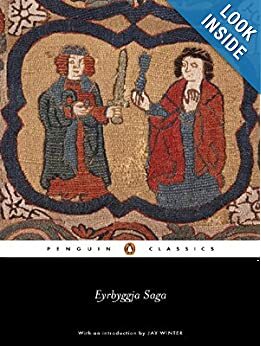 What do we really think of Eyrbyggja Saga? Find out in the latest installment of Saga Thing! In Episode 3a, John and Andy discuss the difficulties of trying to cover Eyrbyggja Saga in one episode…which they then totally fail to do successfully. So we present the first of a two-part episode! Never fear, there’s plenty here to enjoy. You’ll meet Snorri the goði and his rival Arnkel Thorolfsson. Listen as they battle for control of Snæfellsnes Peninsula. This is a tale of fortunes and misfortunes, sweeping conflicts between huge kin-groups, the rise and fall of chieftains, and the little people that get swept up in the mess. But it also features a steamy love affair, a dispute over fine linens, and the exploits of a spectral seal. Don’t miss a moment!! !